As soon as I’d settled into my hotel room, I gathered the neat stacks of zip-bagged potholders from my suitcase. They’d served admirably as art frame protectors for my exhibit at St. Paul’s Within the Walls.It was a lovely, cool morning and my mission was to head straight to the address. 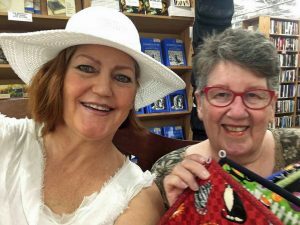 I laughed imagining myself as a smuggler delivering “contraband booty” of cat-themed potholders. Not to sell, well, not for me, anyway. These were for a special non-profit organization. Underground, sort of, but completely legit. 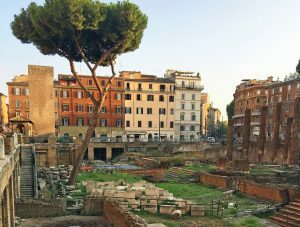 The Largo del Torre Argentina contains the “Area Sacra,” an expansive ruin that was built on top of the senate building where Caesar was assassinated. The top layer of ruins lay at a good 4-5 meters below the surrounding street level. Located in one of the more open parts of the historic labyrinth, it is nevertheless easy to miss – unless you know to look for it. Near one corner of the surrounding piazza, the face of a cat stares out from a large banner, with a soul-searching gaze. This sign marks the top of the stairs that lead to Rome’s most famous and beloved cat sanctuary. Descending closer to the ruins, I imagined cats through the ages as I opened the gate. A wide court adjoins the open entry. Toting the goods in each arm, I went in. A happy diminutive donna/lady looked up. “Buongiorno.” I felt pleased as I reached out and placed the bags on the counter. Una sopresa./A surprise. “Un regalo,” a gift, I explained. Sylvia’s eyes sparkled as she thanked me. I looked around. There were cats in crates, cats in screened rooms, cats in, on, and under furniture. Cats playing, napping and sauntering in and out. Basking in the sun, laying in the shade. The heathy felines free to loll around inside or out amid the flowers, or scale the ruins. Injured, feeble and sick cats are safely housed and attended inside. I asked to greet Leslie’s cat, “Raptus”, if she wasn’t off visiting her boyfriend. Human visitors milled about inside as the manager graciously placed the gift bags inside her tiny office. 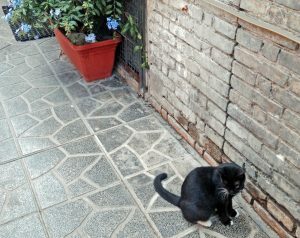 “You can adopt a cat and take it home,” she explained in English to a young British couple, “or you can adopt from a distance: support it and let it stay here. Many people do that.” I scanned the inside and outside again to look for Leslie’s cat. There were plenty of others about, and it felt like a child’s game to find hers. Glancing around, I spied elegant long and short haired cats, tabbies, calicoes, solid black, grey – and white! Eccola!/There she is! – making an entry in her own nonchalant, regal way. It didn’t matter that she barely glanced at me. I had seen her and that was enough.